Two $200 systems offer travelers a lightweight and low-cost way to work with Windows apps on the road. Call it the democratization of technology, but $200 buys an awful lot of notebook today. The staying power of the Chromebook has shown that lightweight, low-cost technology has a place in today's marketplace -- and, perhaps in answer to that, several low-cost Windows 10 laptops have recently hit the market. They appeal to a variety of audiences, from students in need of an inexpensive school PC to business travelers looking for a lightweight second computer for the road. And they have one advantage over Chromebooks: Because they run Windows 10, they can use a wide variety of familiar software. In fact, each of these "Blue Light Specials" comes with a year's subscription to Office 365 Personal and a terabyte of online storage that's worth $70. For this comparison, I tested two low-cost Windows 10 notebooks: The Lenovo IdeaPad 100S and HP Stream 11, two slim, light and stylish computers that make a virtue of simplicity. These are not fire-breathing game machines, by any means. They are basic fan-less systems powered by entry-level processors, with 2GB of RAM and 30GB of solid-state disk storage. What do you have to give up if you choose one of these inexpensive systems? A lot of the creature comforts that midrange notebooks now offer, like more RAM or a touch-screen option. They keyboards aren't backlit and can be a bit cramped, especially if you have large hands. By far, though, the sharpest corner that's been cut is with screens. Both of these notebooks have 11.6-in. LCDs that rely on Twisted Nematic (TN) technology; they show less detail than today's typical smartphone. (Most notebooks offer in-plane switching (IPS) technology that gives sharper images and brighter colors.) And while the displays are large enough for single Web pages or Word documents, it can be awkward (and slow) trying to work with several windows open, and trying to cope with a large spreadsheet is a challenge. At first I had my doubts that a $200 computer was worth the effort and money. After spending two weeks with each, I'm convinced that they can cut it at home and even on business trips. Both systems actually work well and should satisfy most modest computing needs. With HP's first generation Stream now in closeout mode, the second generation Stream 11 picks up where its predecessor leaves off with a smaller and lighter design that adds a USB 3.0 port. Measuring 11.8 x 8.1 x 0.8 in., the Stream 11 is 3 oz. lighter than the first-generation Stream. Still, at 2.6 lb., it's slightly heavier than the 2.3-lb. Lenovo IdeaPad. Plus, it uses a traditional AC power adapter with an awkward three-prong plug, giving it a total travel weight of 2.9 lb. -- about 4 oz. heavier than the IdeaPad's travel weight. The Stream's plastic case is available in two colors: violet purple and cobalt blue hues -- more vibrant than the IdeaPad's more conventional white, red, blue and silver tones. The Stream's 11.6-in. display has a top resolution of 1366 x 768. In brightness tests, it delivered 226 candelas per square meter (cd/m2) vs. the IdeaPad's 177 cd/m2 and, to my eyes, was much more vibrant and rich. Above the display is an HD webcam and pair of microphones. The Stream's keyboard has 18.8mm white keys that stand out well from the colored background; it felt more solid than the IdeaPad's relatively flimsy keyboard. The Stream's 4-in. touchpad is bigger and more comfortable to use than the IdeaPad's. It works with basic gestures, like being able to rotate or zoom in or out of an image. The speakers are located underneath the system and fire downward, but its sound is richer, fuller and sounds less hollow than the IdeaPad's. The output doesn't really get loud enough, but it has a headphone jack for personal listening. There is an HDMI port, one USB 2.0 port and one USB 3.0 port. The Stream has both Bluetooth 4.0 and 802.11n Wi-Fi. While it won't set any performance records, the Stream never let me down in two weeks of daily use, including a couple of train trips. Its Celeron N3050 dual-core processor runs at between 1.6GHz and 2.2GHz, depending on the system's load. Like the IdeaPad, it includes a scant 2GB of RAM and a 30GB solid-state storage system. Of that, only 13GB was available (a good proportion of the rest taken up by software add-ons). Its performance profile was a mixed bag. The newer processor pushed it to a 448.9 on the general-purpose PerformanceTest 8 benchmark vs. the IdeaPad's lesser score of 397.1. On the other hand, the Stream was second best when it came to running the Octane 2.0 series of online tasks, scoring a 4,157.5, nearly 60% off the pace set by the IdeaPad. The Stream also came up short against the IdeaPad in terms of battery life. Its 4,500mAh battery enabled it to play videos continuously from a USB key for 6 hours and 40 minutes, about an hour and a half short of the IdeaPad's time. Still, it should be more than enough battery life for a few movies or gaming sessions on an interminable flight. When I measured the laptop's heat, the Stream had a hot spot at 110-degrees Fahrenheit. The Stream comes with Microsoft's Windows 10 Home and a one-month subscription to McAfee's LiveSafe. It also includes Avast's Secure Line VPN, for those who want their communications to be anonymous, and a copy of the free version of Evernote. The Stream's one-year warranty matches the IdeaPad; extending it to two years costs $80 -- roughly double what it costs for the IdeaPad -- but it includes shipping costs if you have to mail the unit in for repairs. It may not be perfect, but the Stream is a very impressive system for the money. 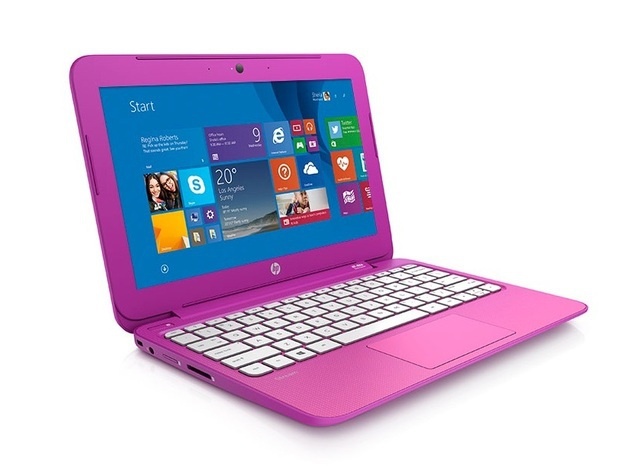 Its bright screen, comfortable keyboard and decent performance make it a great swing PC at home or on the road. 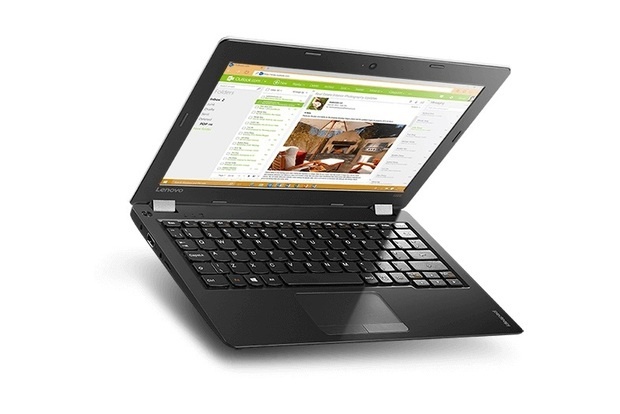 With its IdeaPad 100S, Lenovo has created a value notebook that exceeds expectations. It's a bargain for those who spend their time on the Web. The system is 0.7 in. deep in the front and 0.8 in. in the rear, making it slightly thinner than the Stream. Its 11.4 x 7.9-in. case is shorter and narrower than the Stream's. At 2.3 lb., the IdeaPad is nearly 3 oz. lighter than the Stream. And thanks to its tiny two-prong AC adapter, the IdeaPad can hit the road with a travel weight of just 2.6 lb. That's roughly what the Stream weighs on its own. The plastic case comes in silver, red, white or blue; the silver and red models have a contrasting black edging and inside keyboard/bezel area; on the white and blue models, those areas are white. The laptop easily fits on an airline tray table with room to spare. As with the Stream, the IdeaPad's 11.6-in. display offers 1366 x 768 resolution. It had a brightness rating of 177 cd/m2, measurably lower than the 226 cd/m2 rated by the Stream's screen. More to the point, I thought the IdeaPad's display looked dull and couldn't match the vibrancy of the Stream's screen. The keyboard has responsive 18.5mm keys but felt much flimsier than the Stream's keyboard. The 3.6-in. touchpad is not only smaller than the Stream's, but it also doesn't work with basic gestures. Like the Stream, the IdeaPad's speakers are located under the keyboard. You can get more volume than out of the Stream, but to my ear it had a hollow sound; this laptop is better at spoken word material than music. The system also comes with a VGA webcam and a pair of microphones. It's equipped with Bluetooth 4.0 and 802.11n Wi-Fi. It sports an HDMI port, a headphone jack and a pair of USB 2.0 connectors. While it matches the Stream with 2GB of RAM and a 30GB SSD, the IdeaPad makes 18.3GB of that available for use, 6GB more than the Stream. As with the Stream, much of the space is taken up by bloatware. Its Atom Z3735F quad-core processor runs at between 1.3GHz and 1.8GHz, but at 2.2 watts, it uses a little more than half the juice of the 4-watt Celeron CPU on the Stream -- it never even got warm to the touch. The IdeaPad rated an Octane 2.0 score of 6,548, nearly 60% higher than the Stream's result, indicating the IdeaPad would do better online. However, its more general-purpose PerformanceTest 8 score of 397.1 was 13% less than that of the Stream. The 7,600mAh battery pack is much larger than the Stream's 4,500mAh battery, and it showed -- the IdeaPad tested at 8 hours and 5 minutes on our battery tests. Think of it as an extra hour and a half of movies, gaming or Web browsing. The system includes Microsoft's Windows 10 Home. It comes with Lenovo's SHAREit, an app for moving files between networked computers; there are also versions for Android, iOS and Windows Phone. The one-year warranty can be extended to a second year of mail-in service for $39.20. Small, light and most useful online, the IdeaPad 100S would be a killer computer if it only had a better screen. I am, by nature, a cheapskate who hates to pay extra for unneeded luxuries. So, I was happy to see that both HP and Lenovo have excellent inexpensive notebooks that should do just as well at home, at school or on the road. Neither is perfect, though, and each of these $200 notebooks has both strengths and weaknesses. While the IdeaPad 100S's screen is second-best and its keyboard is flimsy, I love that it can run for over eight hours on a charge and that, with its tiny AC adapter, the entire package adds up to less than 3 lbs. That said, although the HP Stream is a little heavier, and I really dislike its traditional three-prong AC adapter, the Stream's screen is as bright, rich and vivid as computers selling for twice as much. That makes the Stream my choice as the best in this super-cheap class of computers. To see how these two inexpensive notebooks compare, I used each for at least a week in my office, at home and on the road. After measuring and weighing each notebook, I checked out the material that the cases were made out of and how slippery or grippy they were. I measured them and then put each on a mock-up of an airplane seat-back tray table to see how easily it mixed travel and work. I looked over the ports offered on each as well as tried them out by connecting each to a display, a pair of headphones and a 1GB external USB hard drive. Next, I connected each to my office Wi-Fi and then to a Bluetooth speaker. I measured each system's screen brightness with a Konica Minolta LM-1 luminance meter. After setting up the system to display a pure white image, I divided the screen up into three rectangular sections and measured the brightness in each. I converted the foot-lambert readings to candelas per square meter and averaged the three readings. To compare their performance, I benchmarked each system using PassMark's PerformanceTest 8.0 to get a good idea of each machine's overall performance potential for everyday tasks, from creating spreadsheets to writing memos. This suite of tests stresses every major system component, from the processor, memory and hard drive to the graphics. It then compiles the results into a single score that represents its performance potential. I ran the software three times and averaged the results. While I ran the tests, I felt around the system's case for hot spots and recorded them using the Seek Compact infrared camera on an Android tablet. To gauge each system's worst-case battery life, I played six HD and 4K videos from a USB key until the battery was dead. As the battery was discharged, I monitored its status using PassMark's BatteryMon. This test was repeated three times, and the results averaged.